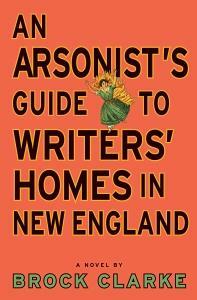 The adage warns us not to judge a book by its cover, though it is hard not to be attracted to Brock Clarke’s most recent novel, An Arsonist’s Guide to Writers’ Homes in New England, what with its tongue-in-cheek title and burning orange background, the color of a Fire Lane warning sign. Thus begins Sam’s tragicomic tale, which, true to the novel’s title, sees the accidental arsonist’s life events intersecting with the homes of Dickinson (whose house, in real life, still stands, lest fans read Clarke and fret), Twain, Frost, and others. So apparently, Clarke allows his characters to judge by covers and first sentences, too! Highly recommended, An Arsonist’s Guide to Writers’ Homes in New England is silly-yet-subversive beach reading for the type of well-read literary nerd that is more likely to spend her summer vacation touring writers’ homes than actually going anywhere near a beach.